“Recently a state historical marker was placed five miles west of Cairo to honor Solon Hannibal Borglum, one of America’s premier sculptors of the 20th century. Borglum, who lived at his father’s ranch, loved the cowboy life but also had a great gift for art and sculpture. When his brother Gutzon, who sculpted Mount Rushmore, visited the ranch west of Cairo in 1890, he saw some of his brother’s works and encouraged Solon to devote his life to art. In 1893 Solon left the ranch he loved and began studying art full time in California, Cincinnati, and Paris. Solon Borglum’s depiction of cowboys, horses, and Indians soon won him international fame. His art became an expression of a man who felt the fierce epic of the West beating in his heart…. the swinging rush of the stampeding herd, the sway of the wind in the prairie grass, the mystical union with the horse and its rider. Today, Borglum’s works can be seen at museums across the country. In addition, the Cairo Roots Museum has set up a display in the hallway at the community center to honor this early Cairo resident who achieved much in his lifetime. The idea to mark the location of the Borglum ranch was first raised more than fifty years ago by old-timers who remembered the Borglum family. 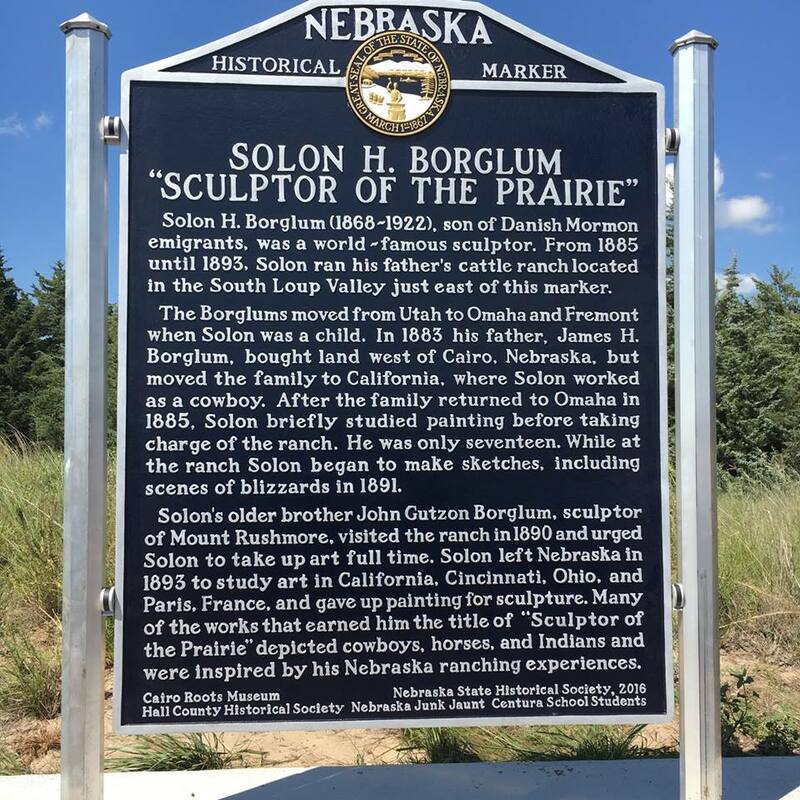 In later years, Jo Riedy contacted Solon Borglum’s daughter and other members of the Borglum family and the Roots Museum continued to bring the idea of a marker before the community.